This 360degree panoramic scene selfie mount redefines the idea of selfie. Shoot anytime and anywhere as you like. Record your life in all angles. Take pictures via remote control. 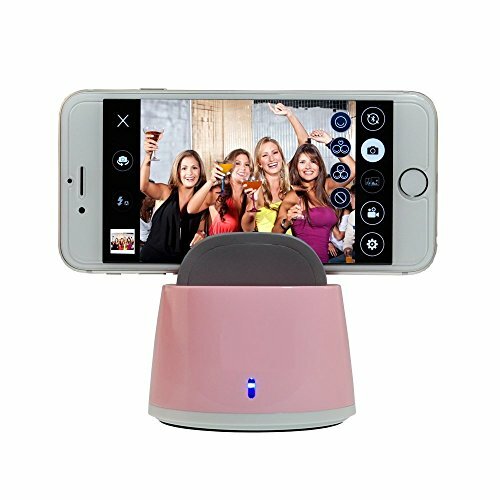 Panorama, cute and 10s delay shooting are the features of our electric 360 degree selfie robot. It is a multifunctional design and can continously work for around 3 hours. The mount of the selfie can attach most phones, active sports cameras, mini SLR, tripod and selfie stick. Remote control is included. Connect the phone by bluetooth. All-round photography experience from 360 degree selfie, expect your special and joyful playing ways. This is a bluetooth wireless remote shutter. It is a handy tool for taking selfies. It is suitable for any cellphone ruuning on iOS or Andriod system. As such it is suitable for iPhone 6/6 Plus/5/5S/5C/4S/4, Samsung Galaxy S3/S4/S5, just name a few. This device can support most phones, active sports cameras, mini SLR, tripod and selfie stick. A remote control is included. The device is connected to phone by Bluetooth 4.0. Remote control can move your phone counterclockwise, clockwise, slow up, slow down, left and right. Picture is taken by remote control. Device also featurs time-lapse photography (10s). This device incorporated latest multifunctional design with super-long standby, and can be used continuously for 3 hours with one charge.